NORTH BROKE-BUT THEY WON WITH 18 AMATEURS (1937, May 15). Smugly confident they came, this band of well-trained – and well paid - warriors of Footscray, the proud leaders, for the formality of delivering a crushing knock-out to the poor poverty-stricken North Melbourne team, in the second Association Semi-Final of 1922. Two hours later Footscray, to a man, woman and child, were retreating home dejectedly across the Saltwater (now Maribyrnong) river, stunned by totally unexpected defeat, while all North Melbourne went mad with joy! THE football miracle had happened! By sheer determination and inspired football, the youthful, unpaid Northerners, every one a staunch amateur, had risen to magnificent heights, and staggered not only the, crowd of 12,000 onlookers, but the whole football world by vanquishing the powerful Footscray combination. For that memorable victory. 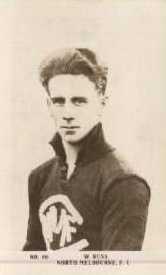 Every player in the North eighteen deserved a medal, inscribed:: “FOR VALOR ON THE FOOTBALL FIELD”. 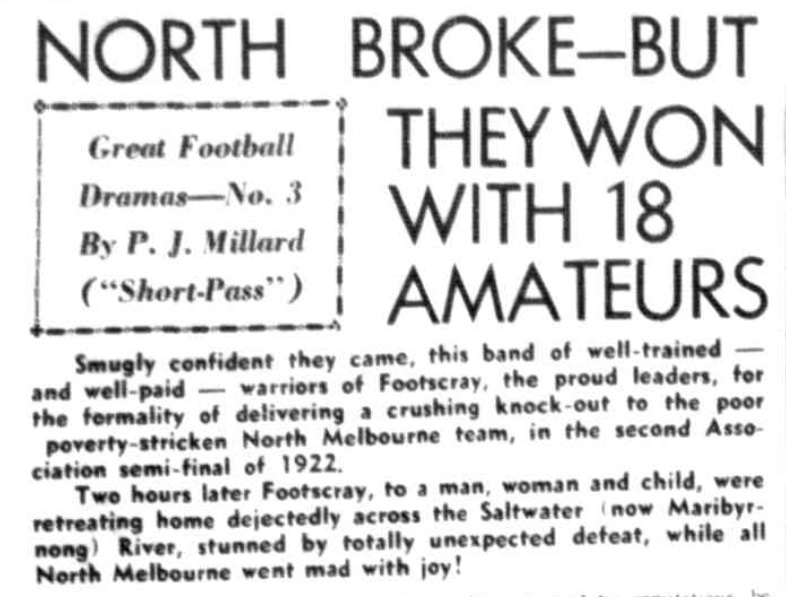 In 1921—the year before this drama—North Melbourne were down and out. 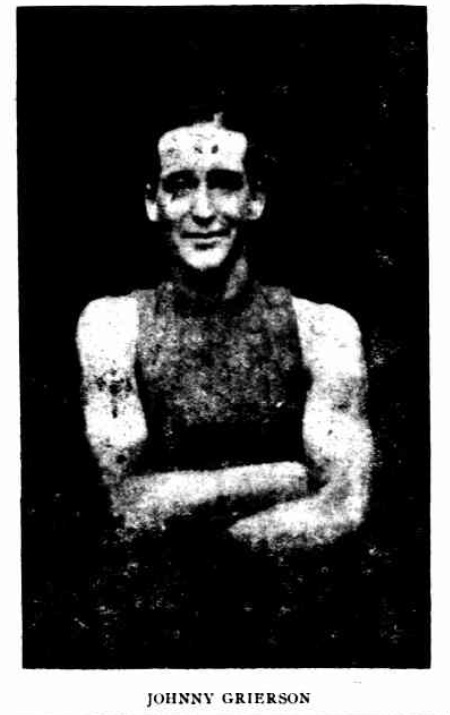 Early that year they threw in their lot with Essendon (L.) who, in consequence, were to play their home games on the North Melbourne ground. 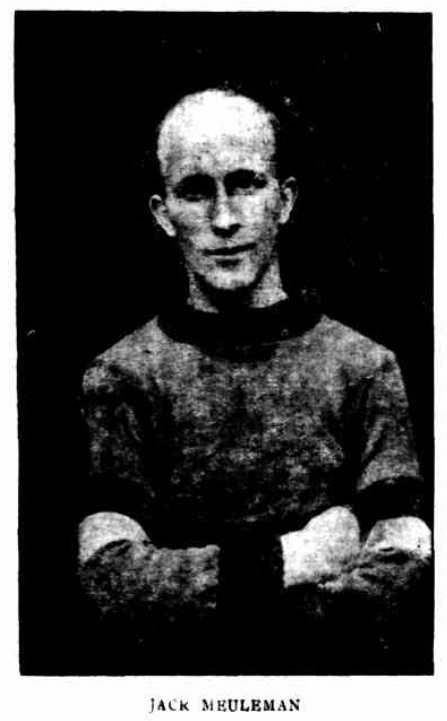 But there was a hitch, and the Dons, who had left East Melbourne ground when it was required for railway yards, made the Essendon ground their headquarters, incidentally taking with them several North players, including the famous ruck pair, Syd. Barker and Charlie Hardy. They, with George Rawle, had formed one of the greatest rucks the game has ever known. Meanwhile, the Association had disqualified the unfortunate North Melbourne club, which was left stranded in the cruelest sense of the word. But brave, loyal hearts continued to beat in the stilled Northern camp on which tragedy had fallen with a heavy hand. Their faith was soon justified. At a public meeting in North Melbourne launched to save the club. George Ravenhall was elected president, with, full authority to act for the club in efforts to get back into the Association. That was the turning-point, especially as Essendon (Assn. ), who had disbanded, came to the rescue. The sequel came quickly. North were graciously re-admitted to the Association, like am erring son returning home, forgiven by strict but loving parents. 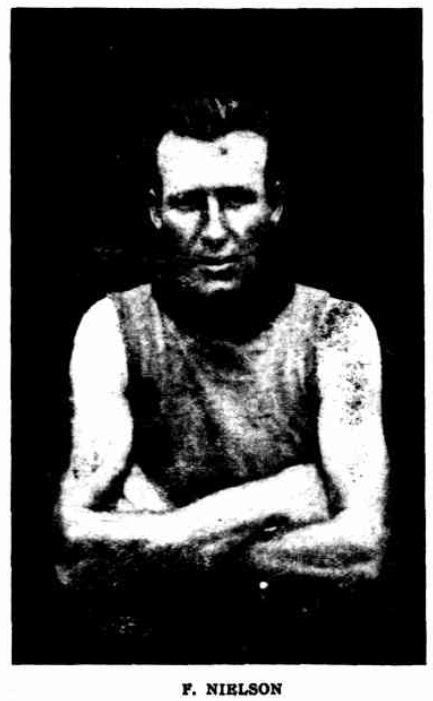 And so, early in 1922. a new North Melbourne, rising from the ashes of disqualification. was confronted with the herculean task of re-building everything — team, executive, membership, and finances. Fortunately for the club, strong, steady hands were at the helm. piloting the repaired Northern Craft safely out of dangerous waters - George Ravenhall as president, and Johnny Heffernan as secretary. Despite an embarrassing shortage of fighting funds - serious handicap against other teams wealthy enough to secure star players instead of being restricted to juniors - North, gripped with new spirit of enterprise. 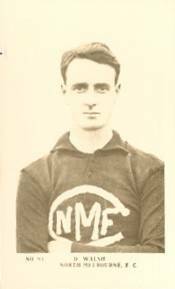 begin to mould a virile young side from local juniors, under that stalwart George Rawle as coach and captain. Long before the season was over the North Melbourne exchequer was as bare as Mother Hubbard's cupboard North were broke - hadn't a feather to fly with. But that did not daunt these young football gallants. They stuck to their beloved club, not one accepting so much as a penny for training, playing or traveling expenses! They played, not for gain, but for love of the game and their club. Scraping in on percentage, Williamstown were defeated by Port Melbourne in the first semi-final, by 13-14 (92) to 8-3 (51). 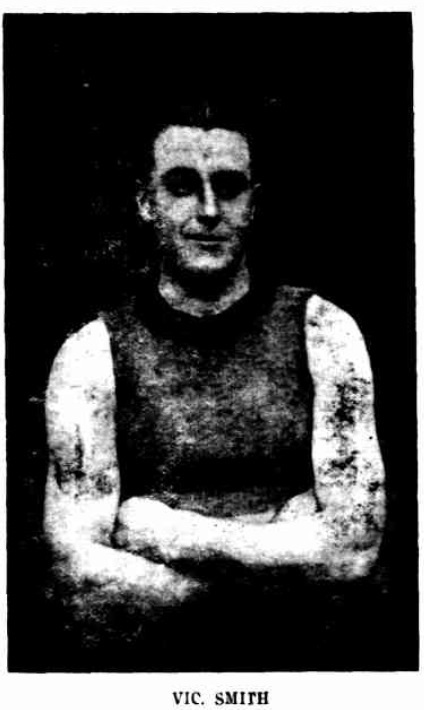 Fifteen thousand people saw the match at the North Melbourne ground, where all the Association finals were played that year. Then came Saturday. 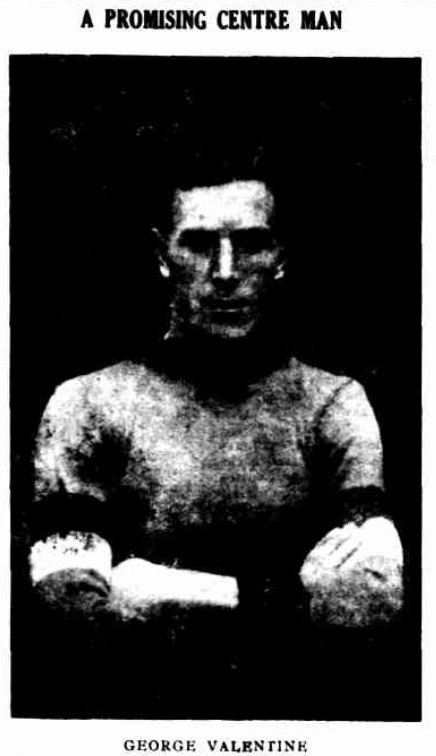 September 9, 1922, with the impoverished North Melbourne facing truculent Footscray. the leaders, before a crowd of 12,000. 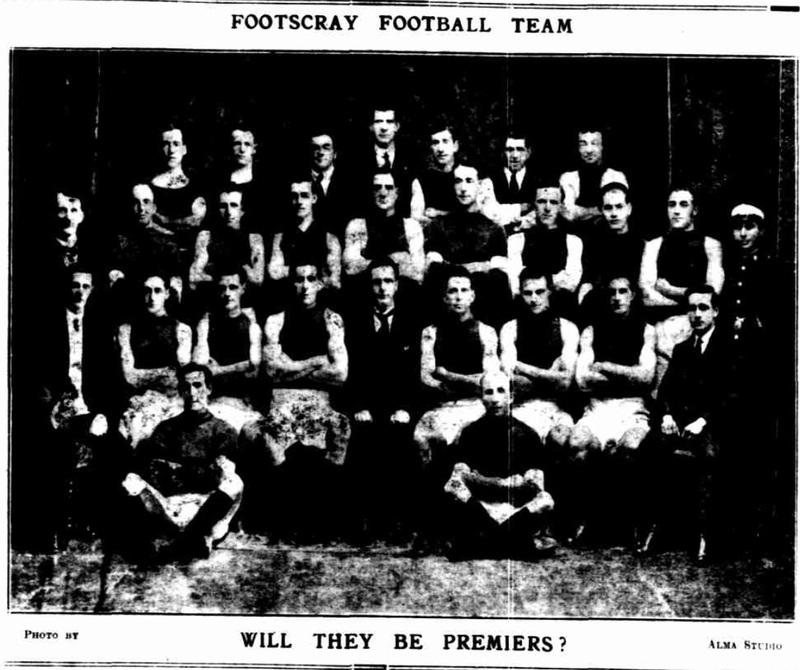 In their glamorous football history, Footscray have had many shocks—including one in 1921. when, as Association premiers, they thrashed Essendon. League premiers—but never a shock as terrific as in that fateful semi-final of 1922. So chock full of confidence were Footscray—before the game—that when they arrived at the ground one of the first things that George Savers, their president did. was to toy to bespeak North’s dressing rooms for the preliminary final with Port Melbourne the following Saturday. “Sorry, but we’ll be wanting it ourselves George Ravenhall coolly retorted! Footscray officials tried to hide their smiles at his temerity. But "he laughs best who laughs last." says the old proverb. The North president certainly had the last laugh that day—and a hearty laugh it was! 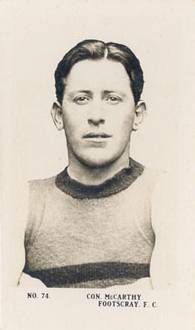 Once the teams got to grips on the field, the tenacious Northerners, refused to be overawed by reputations began to worry Footscray out of their game – and succeeded after the first quarter, never relaxing afterwards. To the stupefaction of Footscray and their army of supporters, North swept home royally by 20 points, achieving a sensational triumph. Instantly North’s 18 heroes were engulfed in seething waves of delirious humanity, joy-crazed supporters – and carried in shoulder high amid a tumult of cheering and shouting. Half-backs: Woodington, Giles, Kew Ming. Footscray, once they had the lead snatched from them, lost their accustomed poise and aplomb; and. although they fought back almost till the last. they could not regain the upper hand. 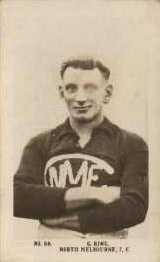 For North that day of days the best in a solid side were:—King (ruck). Fielding and Johnson (rovers), Russ and Shorten (wings). Kew Ming (half-back) but the leadership and ruck work of Rawle was invaluable; and others prominent were Woodington. Linton, Thomas, Walsh, Lindsay, Gardiner and Strownix. 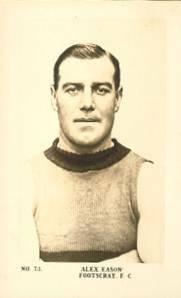 Stan Thomas (who later be- North's secretary) was a committeeman at the time, and stripped only because the team was short of players for the semi-final. He played a sound game. 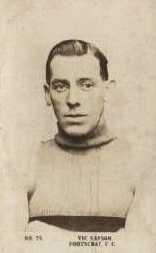 Dave Walsh was soon to become the crack full-back of the League, until his premature retirement. For Footscray, whose usual cohesion smoothness were lacking, three of their stars stood out head and shoulders above their comrades. They were:—Con McCarthy, former noted Collingwood follower: Alex Eason. 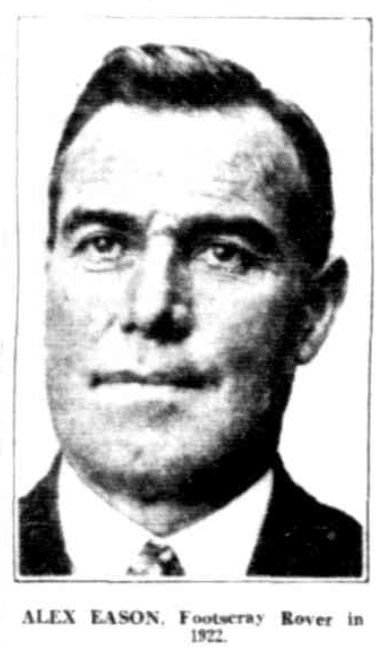 formerly Geelong’s champion rover, and now, in 1937, chairman of selectors at Footscray; and Norman Ford, the champion half-back of Western Australia. That was as far as North went in 1922. The following Saturday, in the "final.'' Port Melbourne downed them by 9.12 (66) to 5.8 (38). Rawle made a move of doubtful value when, on winning the toss, he kicked against the wind, allowing Ports to secure a first term lead of 4.6 to nil. Thereafter North kicked to 5.6, but that blank first quarter was fatal. 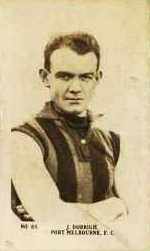 Defeating Footscray in a strenuous, bitter Grand Final by 9.6 (60) to 8.10 (58) Port Melbourne won their first premiership for 21 years. They have not won another since. 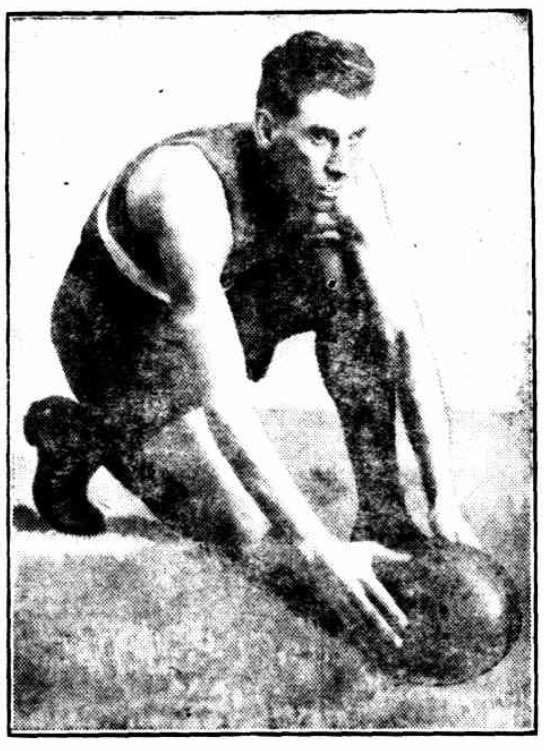 Gus Dobrigh. their leader, fainted as he was coming in after the gruelling struggle. Several other players were exhausted. 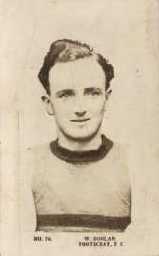 Jack Bisset played well for port in that match. Vic. 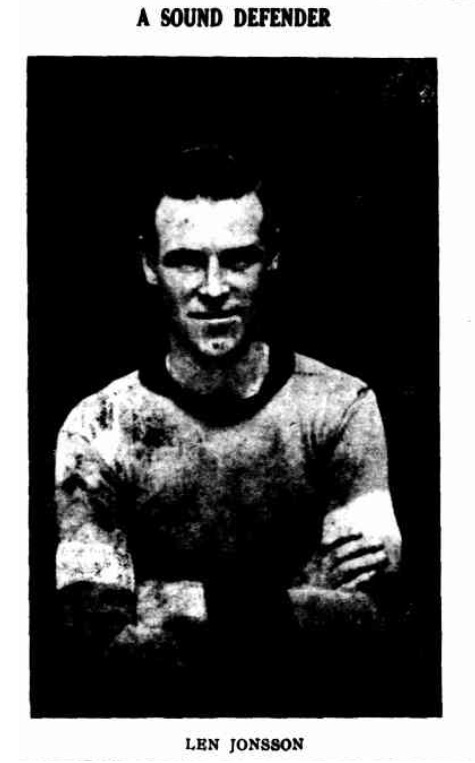 Samson (Footscray), and J. Rudd (P.M.), were the two outstanding heroes of the match. 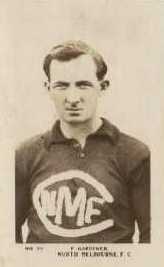 Season 1922 ranks as a milestone in North Melbourne's history. It was the year in which they got on their feel again. It paved the way for their elevation to the League in 1925. 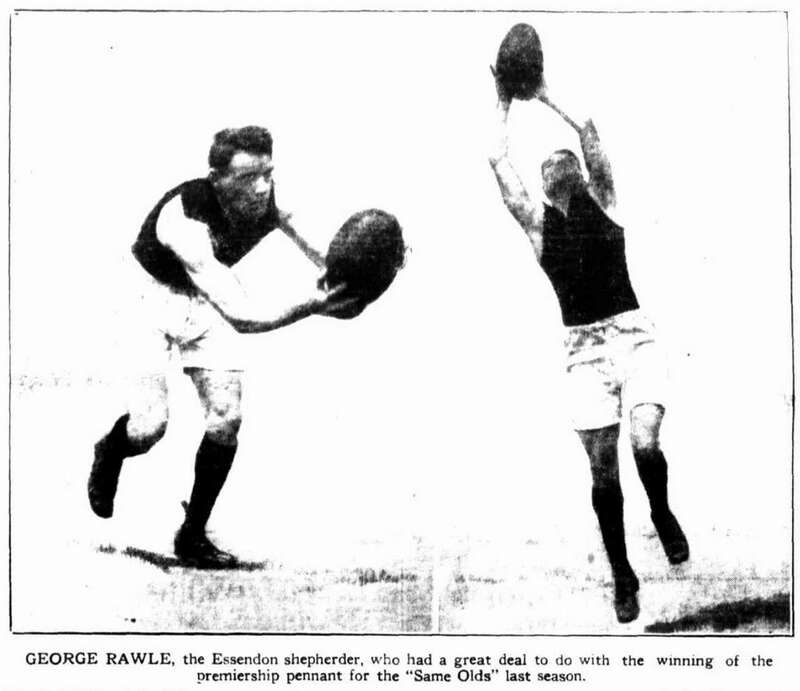 George Rawle (North Melbourne) later moved to Essendon.